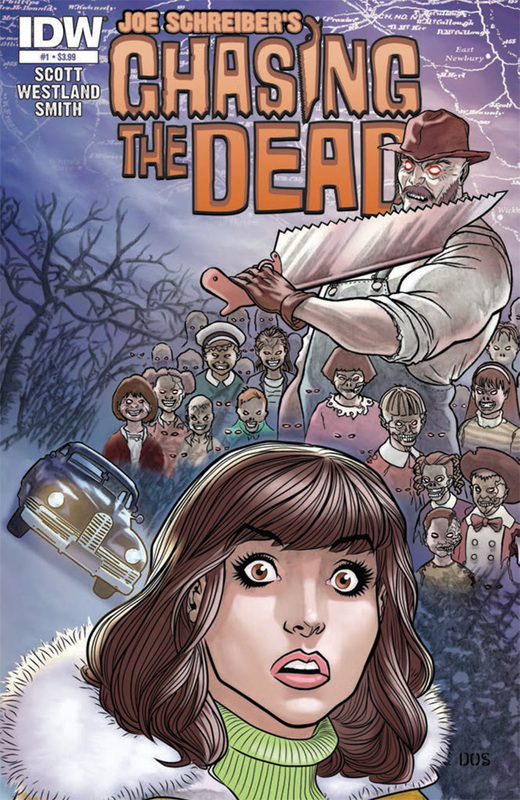 The Fellowship was fortunate enough to obtain a copy of CHASING THE DEAD #1 from IDW Comics. Matthew Scott and Tim Westland write, and Dietrich Smith draws. Sue is doing well for herself. She just took over a very successful company, she’s got a great kid and a great house and a nice life. Then she gets a phone call, and her daughter is gone, and the guy on the phone sends her on a scavenger hunt in a horrendous snowstorm. Back to her hometown, and the past she left behind. This is the beginning of an adaptation of Joe Schreiber’s novel. The story is compelling, too; it plays on some pretty heavy emotions. It’s easy to sympathize with Sue’s situation, and that’s helped by the scenes from her past. The art is also very good. If you’re into a good creepy mystery story, try this one. I’m excited to see the rest of this; it will be fun to see who the antagonist really is. CHASING THE DEAD #1 is available now at your FLCS or by order from idwcomics.com.